Ten years after their discovery, the silicon nanoribbons obtained by epitaxy on a (110) surface of silver finally reveal their structure. At the origin of the infatuation for silicene, these nanoribbons were first presented as the analogue of graphene for silicon. Indeed, theoretical studies have shown that an hexagonal arrangement of silicon atoms possesses properties similar to those of graphene : high carrier mobility, presence of Dirac cones, quantum spin Hall effect. With the possibility of controlled doping, this makes silicene a material of choice for future microelectronics. In order to clarify the doubts raised about the existence of Dirac cones for nanoribbons, researchers at the INSP, Marseille  et Rome studied their structure. By comparing their X-ray diffraction and scanning tunneling microscopy results with all the proposed models, they were able to demonstrate that the silicon was in fact organized in the form of imbricated pentamers. Silicon nanoribbons are obtained by evaporation, under ultra-high vacuum, of silicon on a silver (110) surface. If the substrate is at room temperature, isolated ribbons are obtained. They are oriented along the  axis, their width is 0.8 nm and their length is several hundred nm. If the substrate temperature is maintained at 200°C during growth, the ribbons become twofold and organize in a periodic network, of pitch 2 nm, as can be seen in figure 1a . 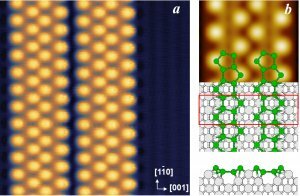 Our first scanning tunneling microscopy (STM) observations, performed in situ during growth have shown that the nanoribbon formation takes place together with a substrate reconstruction. This is the signature of a strong interaction between the two materials  which was rather unexpected since Ag and Si are fully immiscible in the bulk. Our grazing incidence X-ray diffraction (GIXD) measurements performed on the ID3 beamline at ESRF have shown that the substrate undergoes a missing row reconstruction : two out of five Ag rows are missing below the nanoribbons. Following our initial work, different atomistic models have been proposed from numerical simulations based on the Density Functional Theory (DFT) [6,7]. We have then been able to screen all the proposed models by comparing them to our experimental measurements. 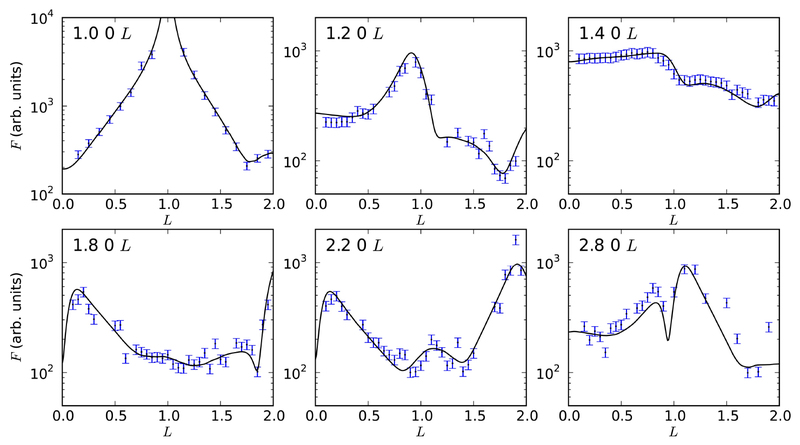 For each model, we have precisely computed the atomic positions by DFT. We have then simulated the STM images and the GIXD diffracted amplitude (structure factors) and compared them with the experimental data. An excellent agreement is obtained with a model where Si atoms are organized as imbricated pentamers (see Figures 1b and 2). This is also the most thermodynamically stable model, in a large range of Si chemical potential, as shown by DFT calculations. a) STM image of Si.Ag(110) nanoribbons (size of the image 62 x 62 nm2) obtained at 200°C. b) atomic model and STM simulated image. Ag and Si atoms are drawn in grey and green respectively. .
Exemples of comparison between experimental (blue dots) and simulated (black line) structure factors, obtained from the pentamer model shown in figure 1b. 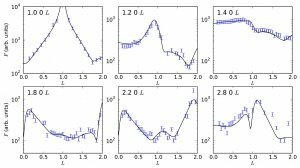 For each figure, the (H, K, L) indices correspond to the diffraction conditions for the measured data. This work demonstrate the existence of a new organization for epitaxial silicon. 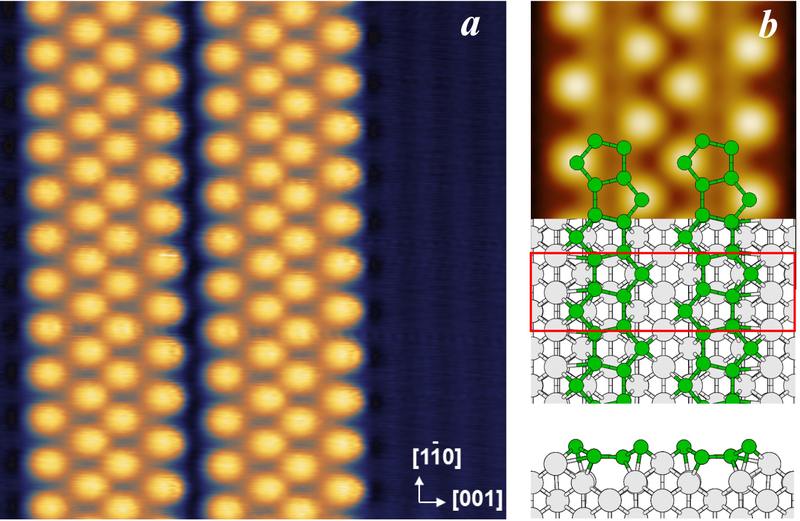 The band structure observed by photoemission that was initially attributed to Dirac cones cannot be related to an hexagonal network of Si atoms. Our work opens however interesting perspectives for the realization of hybrid architectures based on the high geometrical anisotropy of the nanoribbons and the silicon reactivity. 3 - C. Leandri, G. L. Lay, B. Aufray, C. Girardeaux, J. Avila, M. E. Dávila, M. C. Asensio, C. Ottaviani, and A. Cricenti, Surf. Sci. 574, L9 (2005). 4 - H. Sahaf, L. Masson, C. Léandri, B. Aufray, G. Le Lay, and F. Ronci, Appl. Phys. Lett. 90, 263110 (2007). 5 - R. Bernard, T. Leoni, A. Wilson, T. Lelaidier, H. Sahaf, E. Moyen, L. Assaud, L. Santinacci, F. Leroy, F. Cheynis, A. Ranguis, H. Jamgotchian, C. Becker, Y. Borensztein, M. Hanbücken, G. Prévot, and L. Masson, Phys. Rev. B 88, 121411(R) (2013). 6 - C. Hogan, S. Colonna, R. Flammini, A. Cricenti, and F. Ronci, Phys. Rev. B 92, 115439 (2015).